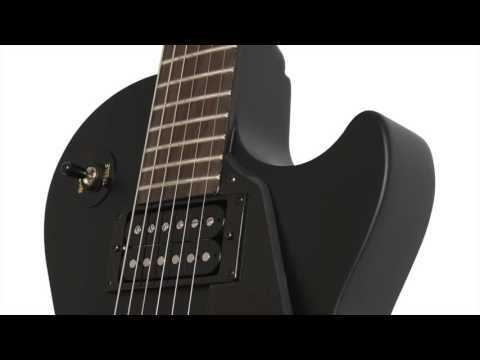 The Epiphone Les Paul Studio Goth Electric Guitar in Pitch Black combines the playability of the Studio model with the cool styling of Epiphone's Goth series. A brooding pitch-black paintjob is complemented by unique finishing touches that include a unique Roman numeral "XII" at the 12th fret and cross headstock inlays. On top of that premium hardware is fitted throughout and open-coil Alnico classic humbuckers deliver blistering tones. The Les Paul Studio Goth adheres to the classic single-cutaway body profile that we've all come to know and love. Built using solid mahogany, the body generates an enviable mid-range energy to establish a solid tonal foundation. The non-weight relieved body creates a substantial feel in the hands, but the curvy body shape guarantees a comfortable playing feel. The pitch-black paintwork is matched with a pitch-black pickguard and black hardware. Joined to the body is a hand-set mahogany neck, which is shaped to a comfortable rounded profile to offer a steady playing support. The generous 24.75-inch scale length promotes a warmer response from each note, whilst encouraging consistency across all strings. Married to the neck is a rosewood fingerboard, which adds to the warm sounding response. There are 22 frets to explore across the bare fingerboard, which adds to the stripped-back Goth aesthetic. The 14-degree headstock setting puts greater pressure on the strings at the nut for increased sustain. Whether you're chopping through power chords, laying down lighting fast legato or sweeping through arpeggios like a wizard, the Les Paul Studio Goth responds like a pro. The Epiphone Les Paul Studio Goth is equipped with a pair of open-coil Alnico humbuckers fitted in the neck and bridge positions. These beauties produce rich tones that are infused with warmth and don't skimp on the vintage vibes. Thanks to Epiphone's double vacuum waxing process, you can rest assured that electromagnetic interference and hum is significantly reduced. Only the highest quality parts have been used such as ABS plastic bobbins, 1010 cold rolled steel pole shoes and screw, Alnico magnets and high-quality magnet wire. Whether you're kicking back at home or playing to adoring fans, these humbuckers give you tone that punches well above its price point. Epiphone's All-metal 3-way pickup selector allows you to chop and change between pickups with ease, whilst independent volume and tone controls for each pickup respond as smoothly as you could wish for. Fitted to the body is a locking tune-o-matic bridge and stopbar tailpiece, which anchor each string securely to optimise intonation and sustain. The headstock is home to Grover tuning machines that secure each string for steadfast tuning integrity. You can rock out to your heart's content safe in the knowledge that the Goth will keep coming back for more.